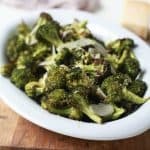 Place broccoli florets on a baking sheet in a single layer. Bake for 20 minutes and remove. In a small bowl mix, butter, lemon juice, lemon zest, and salt to taste. Mix and pour over broccoli. Toss to coat.